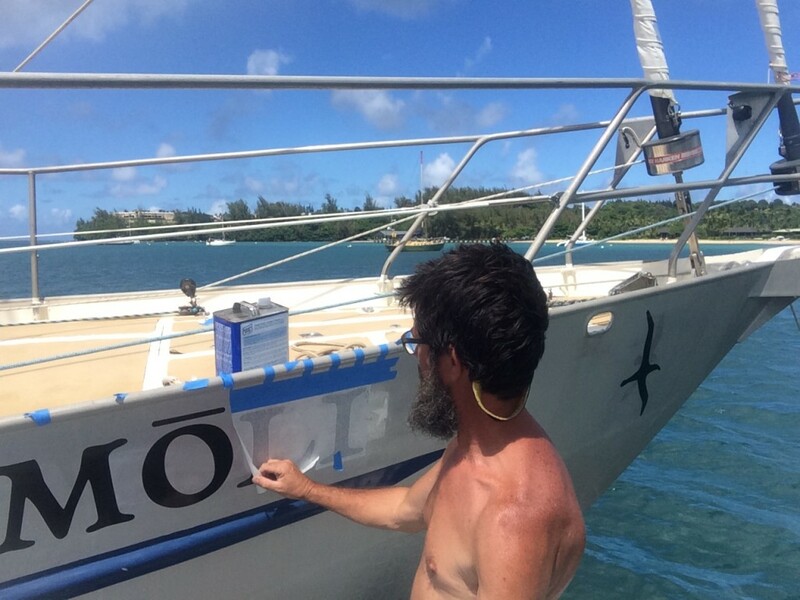 Renaming your boat is forbidden. The rule is unwritten, understood by all, universally ignored. 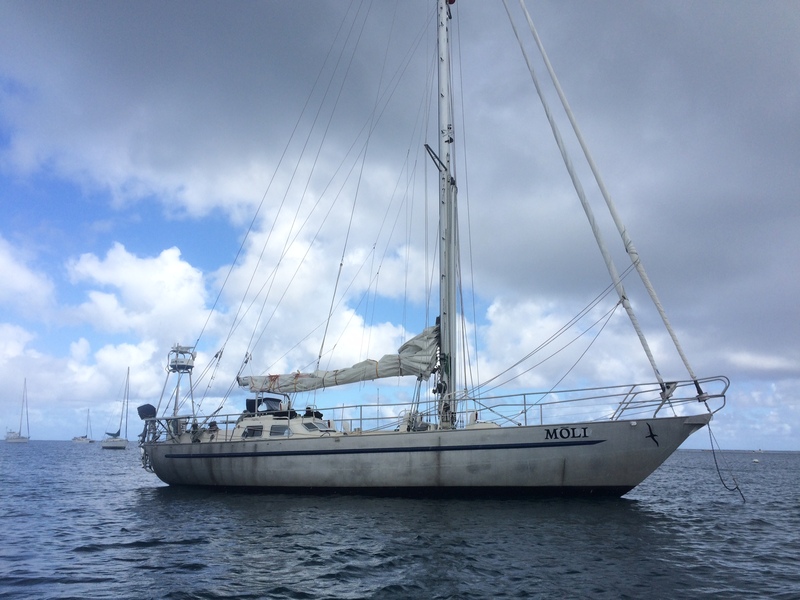 Thus it gives me pleasure to introduce the Figure 8 Voyage vessel, MOLI, nee ASMA, TAONUI, GJOA. 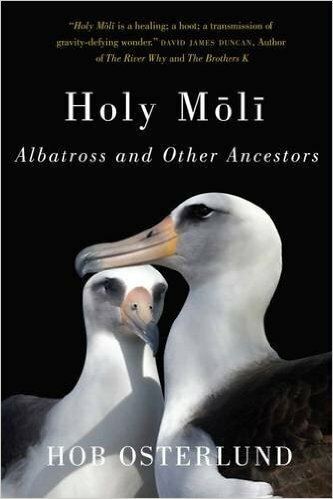 My wife wishes me to point out immediately that MOLI rhymes with HOLY (thus the macron over the “o”) not HOLLY; it is the name that native Hawaiians apply to the Laysan Albatross, which roosts solely in this island chain. Most are partial to the atolls further north, Laysan and Midway, for example, but a growing number are repopulating Kauai. My choice of landfalls, Kauai’s Hanalei Bay, has not been a random one. In 2005, I joined the crew of COYOTE in Hanalei for my first ocean crossing, a rough-and-tumble, fun-as-hell August slog north to Tofino, BC. In 2012, I launched from here in my own boat, MURRE, to solo all the inhabited Hawaiian islands, this as a last hurrah on a solo of the Pacific; then launched from here again for a solo to Alaska. In a sense, Hanalei is where it starts for me as a blue water sailor. Hanalei, or more specifically the windward bluffs nearby Kiluea Point, is also home to one of my favorite pelagics, the MOLI. Anyone who has made a passage north and east over the Pacific High has likely seen this bird soaring in strong winds and big seas with an ease to make a small boat sailor green with envy. These birds are gray bombers; strong and fast, self-assured, wave sailing, ocean marathoning loaners. What’s not to like? Let’s quickly dispense with the idea that the albatross is a symbol of bad luck. Such an idea likely originates with Coleridge’s Rime of the Ancient Mariner, where a dead albatross wreaks havoc on a ship and its crew. But recall that the sailors aboard that ship, as did sailors of that era generally, thought the albatross a bearer of good luck, and misfortune only ensued when a thoughtless crew member shot a bird flying close astern. More importantly, all it takes is seeing one of these masters in action to know that the superstition is just that. Some remarks about the albatross to exemplify my admiration, excerpted from Carl Safina’s Eye of the Albatross, noted below. -During their whole lifespan they expend 95 percent of their existence at sea—flying most of that time. Theirs is a fluid world of wind and wild waters, everything in perpetual motion. -Land is little more than a necessary inconvenience for breeding…an albatross may make round-trip foraging treks of several thousand miles, sleeping aloft, foraging in darkness and daylight, searching out food enough for a single feeding for their single offspring. -And so they span long stretches of space and time, distant from any shore, seldom within sight of a coast, embedded in the breeze. Doing so, they cover distances equivalent to flying around the Earth at the equator three times every year. A fifty-year-old albatross has flown, at minimum, 3.7 million miles. -These creatures are gliding machines. 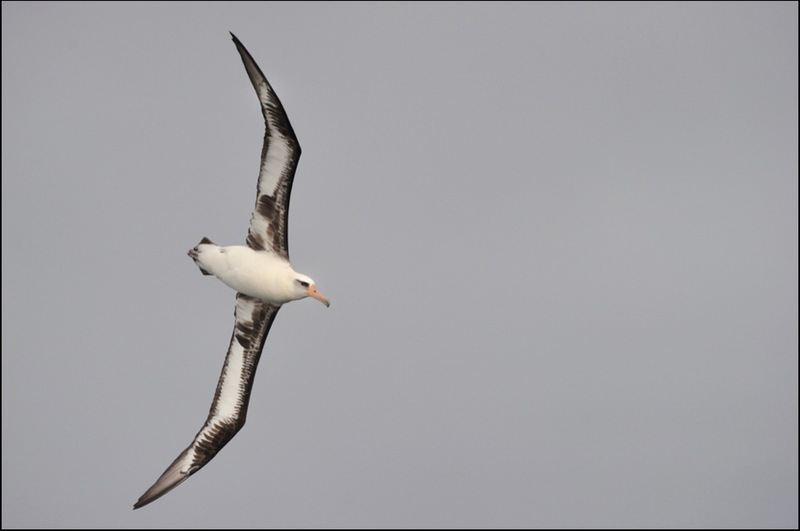 More than anything, albatrosses’ long, narrow wings make them extreme-range mileage mechanisms. The ratio of wingspan to wing width of a Wandering Albatross is 18 to 1, similar to the best-perfected human-made gliders. Their wings’ lift-to-drag ratio—lifting force to air resistance—is a remarkable 40 to 1, more than triple that of many eagles. -…albatrosses as we know them could only have evolved in the windiest place on Earth—the Southern Ocean, where an abundant supply of moving air breathed creation into Life’s most surpassing capacity for flight. -Albatross flight looks easy. You have no idea. A Wandering Albatross’s heart actually beats slower during flight than while sitting on the sea. Black-browed Albatrosses use no more energy while flying than when brooding a chick upon their nest…Here’s one of the birds’ secrets: for the long hours and days of flying, albatrosses needn’t really hold their wings out; using an extraordinary wing lock at the shoulder and an elbow lock for rigidity, they snap them into the unfolded position like opened switchblades. What solo sailor could wish for a better emblem of his aquatic endeavors than an animal completely adapted to, completely comfortable in any weather in any ocean that sailor should choose to explore. 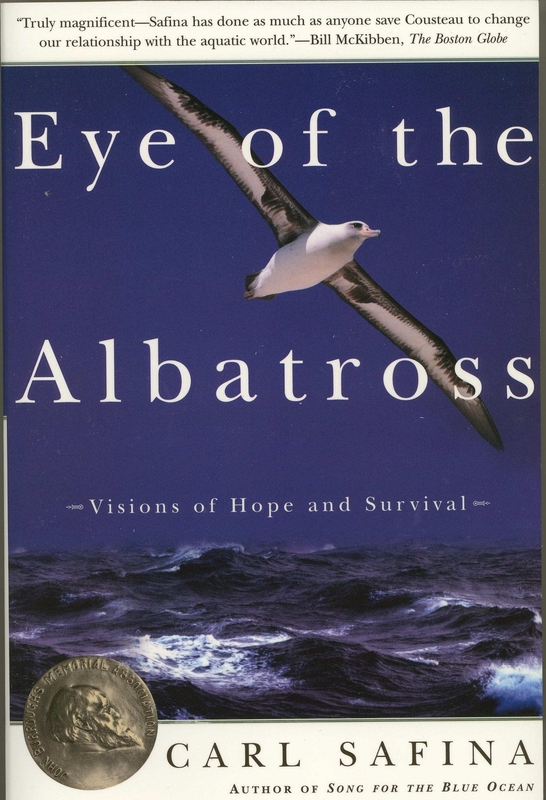 If you are the least bit interested in the MOLI, I recommend Carl Safina’s Eye of the Albatross, a life history of mind-bending breadth and depth focused specifically on the Laysan species. Safina’s tale of a single bird, radio tagged and followed throughout the book, is told with tenderness and is packed with detail. This is the grail of albatross books. Hob Osterlund’s Holy Moli is also well worth exploring. Osterlund founded the Kauai Albatross Network, an organization helping preserve the vitality of the Laysan albatross and promoting safe habitat on the island. Osterlund’s book focuses on the Laysans that roost on Kauai and Midway and is framed as a memoir. Like Safina, her tale is also struck with wonder. I heartily approve of your choice of name. She’s an important boat. Gotta make her yours. Have a safe run back. I shall be interested to hear how far north you have to go. Thanks Kurt. Re “how far north,” you and me both. Right now the High is a big, wobbly monster that seems to encourage a return to Kodiak rather than San Francisco. Sail safe and quick, Randall! Thanks Howard and Stephanie. Engine running. Off momentarily. Much appreciated Lawrence. As always, thanks for following. It all gives me the chills and takes my breath away to imagine weighing anchor and entering the Moli evironment. Its nearly impossible to access those emotions you are experiencing in our society, unless you are a prize fighter or the like. Ill look.you up in the north bay. Maybe we’ll take Reliance for a spin! Just offered up a prayer! Spin an RELIANCE. Heck ya! Name the day. Am back in SF. Never thought of myself as comparable to a prize fighter. I like it. Thanks for following.